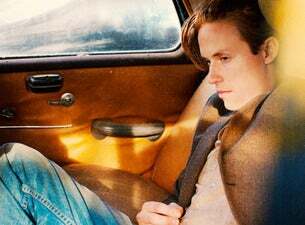 Jonny Lang made a stop at the historic Miller Theater on Sunday night in Augusta. The first chill of the season was in the air, but Lang would soon warm it up with his blazing blues. The amplifiers blared as the band came out for “Don’t Stop (For Anything).” And from that point forward, the electric blues were in full fo rce. Lang sang an extended high note and received an ovation from the audience. Lang then took it into another gear when he performed a blazing solo – which would be a common theme all night long. You could tell Lang was putting his heart and soul into pieces. By the second song, “Signs,” he already had sweat accumulating on his forehead. That sweat would continue to seep its way down his shirt through the evening. “Rack ‘Em Up” was started up with a bass groove and drum beat. Lang jumped in with clean licks. It was sort of a free-form jazz number with the each member of the band getting a solo. Lang cranked out “Snakes,” more of a traditional three-minute rock song versus extended jamming blues. We all know Lang is a master at guitar, but he is also a vocal master with a wide range. He sang with tremendous soul all night long. Lang mentioned that this was the last stop of a five week stand before they get a little break from touring. Lang then introduced the band and each member of the touring crew. 2003’s “Red Light” started off slow then the tempo increased as the song went on. Lang provided delicate chords. He once again showed off his range by holding a high vocal note for an extended amount of time. It climaxed when Lang cranked out another one of his world famous solos. For “Living For The City,” a Stevie Wonder cover, rhythm guitarist Zane Carney and drummer Barry Alexander remained onstage. Carney, who also gave a great performance as the opening act, laid down amazing distorted riffs and a solo. Lang and the others came back out and did what they do best. The last song of the set, “Still Rainin’,” got the crowd clapping to the heavier riff. Lang shredded the solo at the end and then walked off stage. After a couple of minutes, they came back out for “Bring Me Back Home” where Lang once again put on a guitar exhibition by letting a single note ring for a long time. Just Lang remained on the stage as an acoustic guitar was brought to him. He performed an emotional rendition of the slow, somber “Breakin’ Me.” That then transitioned to an acoustic intro of probably his most well known song, “Lie To Me.” The full band returned to electrically finish the song out as Lang performed a blazing wah-wah solo to close out the show. Lang continues to be one of the next generation’s blues greats. He puts on a high performance show. Since he still is young, he still has many years to carry the torch of the blues. The newly renovated Miller Theater keeps booking quality acts like Lang. The low stage makes for an intimate viewing experience. The concert scene in Augusta is in good hands.